Mitch Lerner is Associate Professor of History at The Ohio State University. 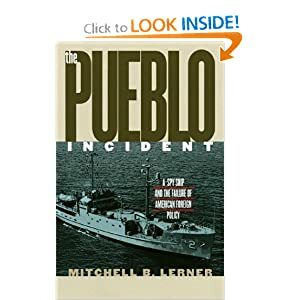 He is the author of "The Pueblo Incident: A Spy Ship and the Failure of American Foreign Policy" (University Press of Kansas, 2002). From the perspective of the diplomatic historian, the recent Wikileaks release of confidential embassy cables is like Christmas coming early, except that the huge box with the picture of the shiny new bike on it that Santa left under the tree contains nothing but one pedal, a horn, and a handful of spokes. The documents are certainly an exciting start, a tantalizing appetizer that has us licking our lips for the real entrée that will come much later, but they are such a small part of the puzzle, and they have so many inherent problems as sources that they are of very limited value. If there is a single country, however, where the Wikileaks cables seem likely to be useful, it would probably be North Korea (DPRK), for the simple and obvious reason that it is so difficult to obtain any materials related to that country and its leadership. The media certainly jumped on this bandwagon, scrutinizing the documents for any detail that might tell us something, anything, about how North Korea works. One of the first articles to appear in the New York Times about the Wikileaks documents focused on the DPRK ("North Korea Keeps the World Guessing"), and other organizations, including the Christian Science Monitor, CNN, and the Guardian, soon followed with similar articles, using the new materials as a means to open a window into the reclusive state. "A Glimpse into the Dark," screamed the headline of the Asia View online column for The Economist. Few details, no matter how seemingly insignificant, were overlooked in this quest for insight. Singapore's Lee Kuan Yew described Kim Jong-il as a "flabby old chap"? Front page! Chinese officials saw him as "quite a good drinker"? Hold the presses! The reality, however, is that the Wikileaks materials on North Korea offer the historian very little that is new. Yes, there are occasional tidbits of interest that, if confirmed by more detailed analysis, will certainly be worthy of inclusion into the historical narrative. But on a general level, the releases so far do one thing above all else: they reinforce some broad points about the conduct of DPRK foreign policy that historians have been making for years, even if those points have not filtered into public consciousness. Although there is allegedly much more to come about North Korea from the Wikileaks collections over the next few months, and although I am admittedly guilty of dramatic overgeneralization, right now there seems to be three broad points about DPRK behavior that emerge from the documents released so far. First, they suggest that China has a lesser influence on the North Korean government than is commonly thought. One cable from early 2010 reported that China had far less control of the DPRK "than most people believe," according to ROK Vice Foreign Minster Chun Yung-woo. Nor does China seem truly committed to the defense of the regime; a number of Chinese officials, Chun claimed, had told him that they accepted as inevitable a DPRK collapse and reunification under South Korean (ROK) control in the not-too distant future. Chinese officials echoed this sentiment themselves, with one reporting in 2009 that his government had stressed to the DPRK its unhappiness with Kim's provocations, but the complaints had had "no effect." Chinese officials were worried about the North's nuclear program but could do little to stop it, he further added, since "the United States was the key while China was only in a position to apply a little oil to the lock." Quietly, DPRK officials seemed to be saying similar things. At one meeting in Mongolia in 2009, DPRK Vice Foreign Minister Kim Yong-il criticized China for its support of recent UN resolutions related to Korea, and described the six-party talks that included China as intended to destroy North Korea. "At present," Kim told his hosts, "the DPRK wants to talk only to the United States." Second, the leaks suggest that the internal DPRK situation might be even more tumultuous than most people recognize, especially on a political level. The nation clearly teeters on the brink of economic catastrophe. One 2009 cable spoke of "increasing economic disorder," and "decades of economic 'depression'," while another report in 2010 quoted the ROK Vice Foreign Minster as saying that the nation had already collapsed and was unlikely to receive enough aid, even from China, to reverse course. In the eyes of most observers, this economic collapse mirrored (and probably precipitated) an emerging struggle for power. ROK National Security Advisor Kim Sung-hwan informed the American ambassador in 2010 that things inside the country "appeared increasingly unstable," noting that the North's attempts at currency reform had sparked "strong resentment throughout DPRK society," and "credible reports of unrest." ROK Foreign Minster Yu Myung-hwan described an "increasingly chaotic" internal situation, one that was reflected in the number of high-ranking DPRK officials that had recently defected to the South (a fact that had not been made public). The transition of power in the North, he added, was "not going smoothly." The continuing economic troubles, according to one unnamed but clearly well informed official (presumably Chinese), had sparked "dissatisfaction among some elite groups in the DPRK." Chinese officials hinted at a power struggle between the military and the Kim family, with the Chinese ambassador to Kazakhstan telling an American official in June 2009 that one of Kim's recent pronouncements was designed to remind the military that despite his health problems, he remained in control. Even Kim himself seemed worried about perpetuating the family dynasty, becoming "obsessed" with creating political stability for the expected succession, noted one report. Third, the leaks suggest that the real target of North Korean foreign policy is their domestic audience. DPRK actions, the cables repeatedly suggest, have less to do with the realities of the international arena than they do with the need to rally the people against a foreign threat in order to justify shortages at home and dampen potential unrest, and perhaps even win American assistance down the road as part of a solution to the crises Kim had created. "To tamp down this internal dissent," concluded an unnamed source in one cable, "external tension was needed." The North's "determination to maintain internal order" the source concluded "meant that it could go so far as to engage in 'limited armed conflict' with the ROK." A Chinese source agreed, speculating that "the rapid pace of provocative actions in North Korea…might be part of a gambit under which Kim Jong-il would escalate tensions with the United States so that his successor, presumably Kim Jong-un, could then step in and ease those tensions." Domestic politics, the official concluded, were "in a large way responsible for Pyongyang's recent actions." We learn lots of other interesting (albeit unconfirmed) tidbits from the documents. We learn that when ROK President Lee Myung-bak pressed Chinese leaders about their contingency plans related to the DPRK domestic political situation, Chinese President Hu Jintao pretended not to hear him. We learn that the American ambassador in Seoul hoped the American business community would "stop being so lazy" in its efforts to get the Korean Free Trade Agreement passed through Congress, and speculated that the U.S. might consider paying North Korea for the right to conduct operations to recover the remains of American soldiers left inside North Korea. We learn that Chinese officials were worried about the proximity of the North's nuclear facilities to their border because of the "dire consequences for Northeast China" should an accident occur. And we learn that Kim Jong-il responded to three failed coups in the 1990s by executing everyone who had been "even remotely involved in the plots." And of course, we learned that Kim is considered flabby and a good drinker. Still, the most striking thing from the historical perspective is how surprisingly unsurprising this all is. Although many in the American public will no doubt be shocked to learn that Chinese influence on North Korea is overstated; that the Kim dynasty sometimes faces internal political instability; and that DPRK leaders use foreign policy to manipulate the people and perpetuate their regime, historians have been making the same arguments for years. The North Korea International Documentation Project, part of the Cold War International History Project in Washington D.C., has in fact recently released numerous Cold War-era documents about North Korea obtained from the archives of the former Communist bloc states, many of which reflect the same points. Consider, for example, an enormous collection of such materials just released from the 1968-69 Korean crisis. These documents show that tensions between China and the DPRK had reached such heights by late 1967 that Chinese Red Guards killed a number of ethnic Koreans living in the PRC, and then placed the dead bodies on a freight train that returned to the DPRK with anti-Korean writings scrawled all over it, including one message reading: "That's how you will fare as well, you little revisionists." The same collection depicts a country in the midst of terrible economic turmoil that was breeding popular discontent; "Indifference, passivity, and distrust concerning the regime's policies were observable in the population's attitude," wrote the Hungarian embassy. Kim Il-sung seemed almost as concerned about his regime then as his son seems today, and launched a series of political reforms and purges; recent actions, wrote one Soviet official in the late 1960s, were "evidence of a desire of the Korean leadership to involve new people in running the party and the country from among those who unquestionably approve of Kim Il-sung's current domestic and foreign policies." Nor is the current regime's willingness to manufacture international crises in order to perpetuate their rule news to anyone who reads this collection; the "spreading military psychosis had other functions," concluded a Czech report in 1968, "like distracting people from the existing economic difficulties, 'justifying' stagnation of the standard of living, demanding the strictest discipline and obedience, and preventing any criticism." In an interview this summer, Julian Assange, the founder of wikileaks, explained that he was releasing materials to "change public opinion and … change the opinion of people in positions of political and diplomatic influence." On that level, the North Korean materials have fallen dramatically short so far. There may be more earth-shattering releases coming but to this point the collection is better at confirming (tentatively, at best) what we already know than it is at telling us something we don't. The material isn't always pretty and it isn't always positive, but it isn't really shocking either. In North Korea, it seems, the more things change, the more they stay the same.